Chocolate: pâte a choux with creamy chocolate filling. Vanilla: pâte a choux with creamy vanilla filling. Coconut: pâte a choux with creamy coconut filling. Raspberry: pâte a choux creamy raspberry filling. Lemon: pâte a choux creamy lemon filling. Matcha: pâte a choux creamy green tea filling. Mocha: pâte a choux creamy mocha filling. 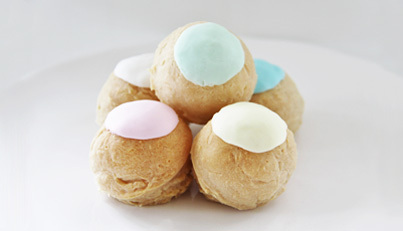 Our cream puffs are made with vegan pastry, without the top 10 food allergens or gluten. They are filled with an unctuous cream with different flavors. Mouth-watering!